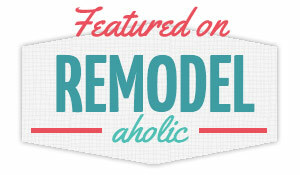 The Happy Homebodies: Top Projects of 2011! Don't you love the promise and excitement of a brand new year? I know I do! We wanted a brand new kitchen, but we didn't have the moolah for that kind of project. Instead we revamped the existing kitchen on a tight budget by replacing the appliances, painting the cabinets, adding a back splash, installing a new floor and creating open shelving. Total cost: $2,315. Not bad, right? You can get all of the details and product information HERE. 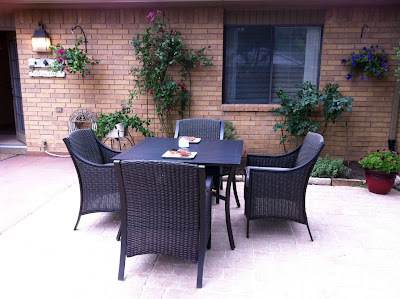 Over the course of several weekends, the husband and I were able to create a new patio for our house. It was hard labor but SO worth it, and we saved thousands by doing the work ourselves. We spent so many summer evenings in our new outdoor space, eating dinner and hanging out with friends. Read about the actual patio HERE and the rock border HERE. Our close friends welcomed a baby boy in April, and I had the privilege of working on his nursery. The bedding had a forest theme, so I decided to paint a birch tree mural. We added some fun accessories and did a big reveal for the parents. They were very happy with how it came out! More pictures and information can be found HERE. Our poor guest bathroom, used by my husband because we do NOT share bathrooms, was in really rough shape. There was a dumpy red vanity, dated linoleum floor, tiny yellowed bathtub and yucky toilet. We collected the new pieces over several months and finally tackled the renovation in late June. The husband did almost all of the work himself, teaching himself some plumbing skills so that he could install the new bathtub. He also installed the travertine floors (left over from a project at my parents' house), toilet and new vanity. My only contribution was the paper collage over the toilet! He did a fantastic job! Details available HERE. When the husband was consumed with football two-a-days this August, I decided to give my closet a makeover. What was once a dark, masculine cedar-lined closet became a bright, girly storage space. I whitewashed the wood, installed new floors and created a DIY faux crystal chandelier (one of my favorite projects of the entire year). Check it out HERE. New year = new stuff to do! Can't wait to share more projects with you in 2012. It's going to be a great year – I can feel it! Pops of Blue & New Dining Table!